Physics is learned from educators and by study of books which describe physical reality in scientific We start with matter, space and time. prove: (A - B)² = A² - 2AB + B². The Great Pyramid of Egypt was constructed to precise proportions. A hypothesis is that the pyramid was constructed to fit inside an imaginary hemisphere with each of its corners and its peak touching the hemisphere. Suppose the hypothesis were true. Calculate the resulting angle each face would make with the horizontal plane of the desert. The connected mechanical parts whereby explosive combustion becomes power of a rotating shaft are called "power trains." The simplest arrangement, crank-rod-piston, shown. Engine designers must know precicely the position and speed of the piston face for every position of the crank. The math tool, vectors, makes this task logically systematic. When detail is omitted, approximation is required. "A dog runs back and forth between its two owners, who are walking toward one another... What distance will the dog have traveled when the three meet?" Two boys, walking beside railroad tracks heard a train approaching from behind. The older boy knew the city train speeds limit was 30 mph. He and his buddy walked about 3 feet per second. When the nose of the engine was abreast of them, the smaller boy began to count. The count, the instant the caboose passed, was, "... 34 seconds." A moment later, the older boy said, "... only about 1400 feet long." 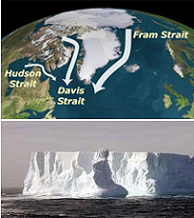 In the Davis Strait, a massive ice slab has cleaved from the ice-shelf and is drifting toward an oil rig. Our largest tug, (pulling constantly at 90° to the current), will drag the slab off-course so it passes abreast of the oil rig, at a distance no closer than 4000 meters. 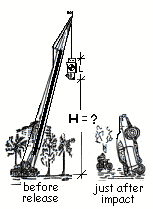 Calculate the towing force required of the tug to accomplish the task. The ideal (leakproof and frictionless) piston/cylinder apparatus is useful. Design and setup of bungee jumping ropes is a "life or death" matter. Done wrong, we read about it in the newspapers. The rail of the New River Gorge Bridge passes 785 feet above the surface of the slow, trickling stream, the New River. Our jumper, a 120 pound "living-dangerous" lady, wants ropes set so at the bottom of her jump she can grab a fist of water from the river.